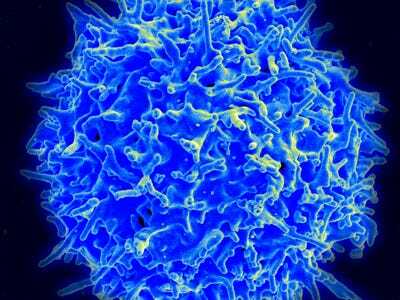 NIAID / FlickrA healthy human t-cell is shown in this scanning electron micrograph image. Bristol-Myers Squibb on Monday said that its cancer immunotherapy treatments succeeded in a late-stage trial in a particular group of non-small cell lung cancer patients. In patients that had a certain amount of tumour mutations, the treatment – a combination of Opdivo and Yervoy – was superior at keeping cancer patients’ disease from progressing than chemotherapy. BMS used a new way of evaluating cancer patients to get to this conclusion, which raised some eyebrows. Bristol-Myers Squibb just had a make-or-break moment. In a much-anticipated study, BMS showed how its drugs Opdivo and Yervoy stack up when treating lung cancer before other treatments compared to chemotherapy. While the study is still ongoing, on Monday, BMS said that the combination managed to work better at keeping cancer patients’ disease from progressing than chemotherapy – that is, in a certain group of lung cancer patients. 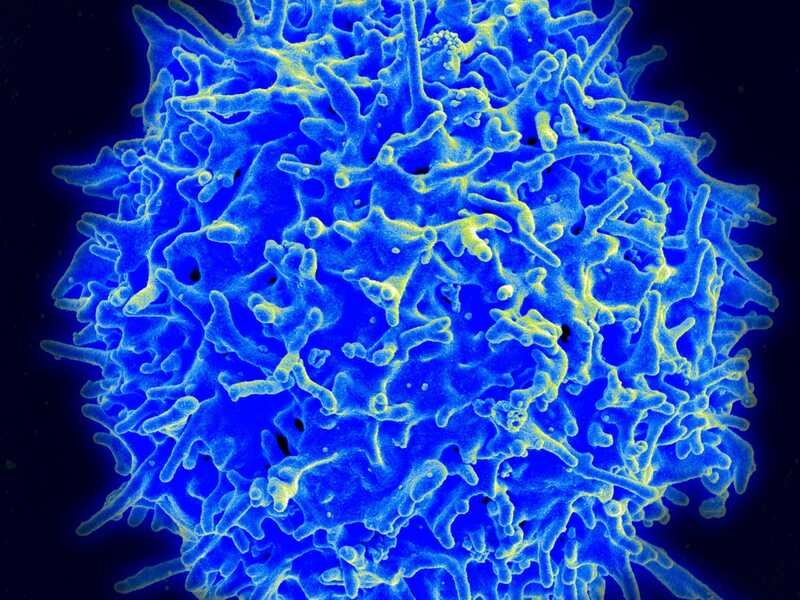 These treatments are part of a new field of cancer treatment called cancer immunotherapy, in which the body’s immune system is manipulated to treat the disease. In the case of Opdivo and Yervoy, known as checkpoint inhibitors, the drugs tell the immune system to take the foot off the brakes and go after cancer cells it might not have otherwise attacked. As part of the study, BMS looked at biomarkers, measurements used to better understand why some patients respond to treatment and other might not. The results raised eyebrows, however, because the results on Monday were pinned to an unexpected new biomarker instead of what’s traditionally been used. Typically, studies involving checkpoint inhibitors have looked at how much PD-L1 protein is expressed in the body, which corresponds to Opdivo, which goes after the PD-1 (short for programmed cell death 1) receptor. In this case however, BMS looked at a new biomarker called tumour mutation burden. In lung cancer patients who had high TMB (45% of the patients in the trial qualified), the treatment was considered superior to chemotherapy in keeping cancer from progressing. The drugs have been around for a few years, but getting approved to treat lung cancer before other treatment options would open the drug up to a lot more people. BMS said Monday that Opdivo itself made $US4.9 billion in revenue in 2017, while Yervoy made $US1.2 billion. This trial opens up the possibility of using immunotherapy not just after chemotherapy has failed or in combination with chemotherapy. It could mean patients might be able to use this treatment that harnesses the body’s immune system to treat lung cancer instead of using chemotherapy that aims to knock out every fast dividing cell. BMS has had setbacks in lung cancer. In 2016, its study evaluating how well Opdivo worked in first lung cancer patients didn’t hit its primary endpoint of progression-free survival in patients with at least 5% PD-L1 expression in tumours. Its competitor, Keytruda, is approved to treat lung cancer in combination with chemotherapy. This was the first study that also looked at TMB regardless of how much PD-1 the patients expressed. The study will continue to determine whether the treatment will improve the overall survival – the length of time lived after treatment – of these patients with high TMB. For some analysts, including Bernstein analyst Tim Anderson and Jefferies analyst Jeffrey Holford, there was too much information still missing from the trial as a whole to figure out what it means. “The company exuded confidence in its newly-disclosed PFS data, in TMB as a biomarker, and in the future of Yervoy, but in our view, several very important questions remain,” Anderson said on Monday.